Body-Solid Functional Training Center 200 review and photos by MTL. Fully adjustable pulley placement (very smooth adjustment when Armor-All'd). 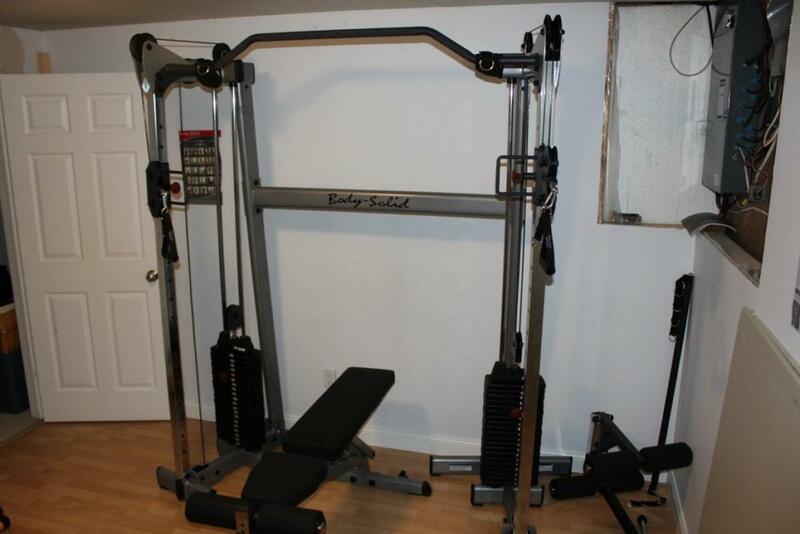 Ergonomic chin-up bar (very solid, knurled grip). Smooth cable movement (no binding anywhere, but need to Armor-All slides). 210 lb weight stack (unfortunately, like most crossovers, it's only 1:2 ratio). Comes with 4-way adjustable hand straps (very versatile). Comes with ankle/wrist straps (can be creative with exercises). Works fine with my GFID31 bench (as well as the GPCA1 preacher attachment). Taller people need to do lat pulldowns from the floor. Can't fully hang for pull-ups (minor issue). Should come with push-lock pins for weight adjustments. The adjustable cable pulley handles ding/chip too easily (at least on one side). 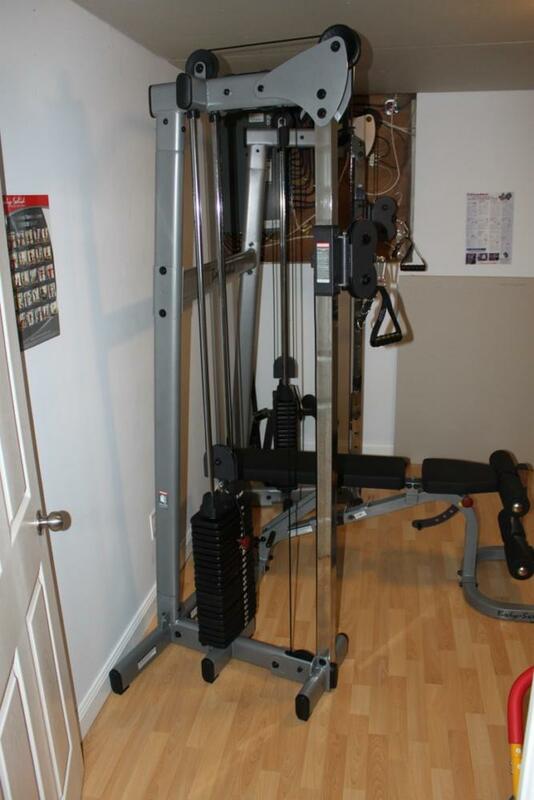 I did buy a few more attachments for the machine including an EZ Curl Bar and Body-Solid Squat Bar which do add a lot of additional functionality to the machine (key for a small space). I would like to have seen a way to tie into the bench's GLDA1 leg attachment but maybe that will come in some future equipment revision. I'm a bit worried about the chipping on the pulley adjuster handles since one side appears to be chipping quite rapidly. I'm going to contact Body-Solid and see if they will replace it for me (will report back on customer service). I also threw in some pics of the machine and how my home gym is set up (it's a work in progress so bear with the unfinished drywall) so those of you with space challenged houses like I have can at least get some ideas. 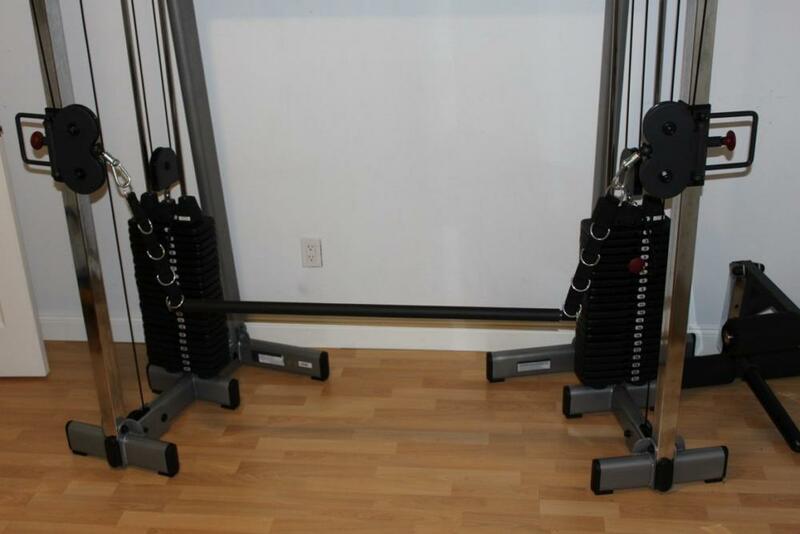 If you are in the market for a home gym machine, you should seriously look at an adjustable cable crossover like this since it can take the place of so many other machines with a very small footprint. Maybe if we do end up moving someday I'll add my power rack to the collection, but until then, this setup has done us very well. Comment on review: I noticed you have the hi-low pulley installed as the instructions say to install them. I flipped them where the right one is on the left and the left one is on the right. Reason is I didn't like having the handles facing inside because they kind of got in the way. Response: I like your idea of flipping the pulley adjusters to the outside, I don't know why BS didn't design it this way from the get-go. One of my handles is already badly chipped because of this setup. Much more freedom of movement when inside the machine and it takes negligible more time to reach around to adjust them from the outside. 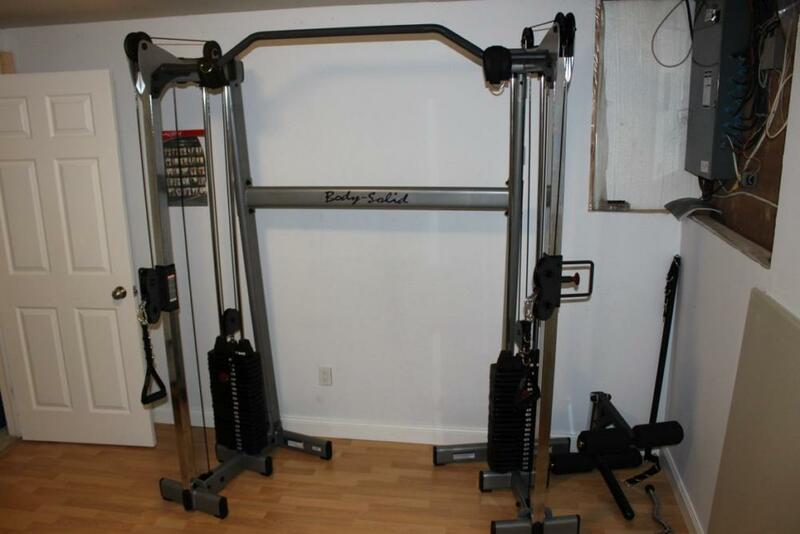 I highly recommend anyone getting (or if you already have) a Body-Solid 210 or a 200 Functional Trainer should definitely install (modify) it this way instead of what the assembly manual indicates. Dimensions: 83.5"H x 74.5"L x 40.5"W.
Kyle S Just wondering how well you still like your Body Solid Functional Training Center 200. I've been looking at getting one but can't decide between that or the 210 model (still don't know what the difference between those two are). Kyle S Thanks Barry, I did some digging and found that the 200 has a wider footprint and may be better suited for taller people factoring in range of motion.